CU-River Mining has purchased the site of a former Port Augusta power station from Flinders Power to develop a $250 million port facility in the Spencer Gulf, South Australia. The facility is expected to have a capacity of up to 15 million tonnes per year for the storage of “iron ore, grain and other commodities”, with the potential for eventual expansion towards more than 50 million tonnes per year. 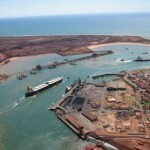 The Adelaide-based iron ore producer plans to employ over 150 people during the construction phase, and up to 100 people for full-time operational positions once construction is complete. The company expects to be ready for production within two years. CU-River acknowledged the 1068 hectare site’s existing five-kilometre rail loop and unloading systems as an attractive element of the acquisition. The company is also interested in examining the prospect of a large-scale solar farm at the site. “The purchase of the site is a significant, strategic decision that allows CU-River to secure a direct export pathway for the 15 million tonnes of high-grade iron ore magnetite it plans to mine each year from 2026,” said CU-River external affairs manager Shelaye Boothey. Flinders Power was in charge of demolition and remediation activities at the 1068-hectare plant site (through works by contractor McMahon Services), which entered into disuse in May 2016. Chief executive officer Peter Georgaris said Flinders Power would still meet its closure and rehabilitation obligations at the port, which would be restarting commercial shipping operations for the first time in decades. “We are focused on a successful transition to a new and exciting future for this significant infrastructure site,” Georgaris said.